The first performance of the Three Little Pieces took place in May 1960 as part of the Whitsun Conference of the Institute For Contemporary Music And Music Education in Darmstadt. It was performed by an orchestra of students of the Darmstadt Music Academy, conducted by Walter Kolneder. In order to provide his young cello pupils with an effective performance piece, Bertold Hummel wrote his Little Suite for cello and piano in the year 1956. 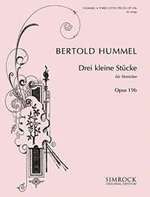 Since its publication in 1976 (Simrock EE 2954), the work has been one of the most successful set pieces in this genre, along with Hummel's adaptation for viola and piano written in 1990 (Simrock EE 2954a). In 1960, my father extended and orchestrated the work in compliance with the wishes of the publisher, Bernhard Bosse, who edited it for strings in the same year under the title Three Little Pieces. The striking themes and rhythms of the three unequal character pieces, now entitled Intrada - Melodia -Capriccio, allow both performers and listeners to get into the swing of contemporary music. The moderate level of the work enables even musicians with limited command of their instrument's ranges to enjoy playing in an ensemble. With this new edition, the numerous youth and amateur orchestras that are looking for music which not only sounds good but also meets their level once again have such work at their disposal. It is a work that, even 50 years after it was written, has not lost any of its freshness and vitality. The Three Little Pieces for strings are an early work, composed by Bertold Hummel out of pure joy in music-making. This composition is deliberately kept at a technical level that enables an amateur orchestra to perform it. The Three Little Pieces for Strings are an early work, composed by Bertold Hummel for the joy of music-making. The degree of difficulty of this composition has intentionally been kept such that it can easily be performed even by amateur orchestras. 'It was not beneath the composer to write for the young people three little pieces suitable for strings and tailor-made for the perfectly developed tonal body,' wrote the German newspaper Frankfurter Allgemeine Zeitung. The carefully revised and newly edited work, published by Simrock, will be a real find for curious chamber musicians and concert organizers. The composer from Würzburg was not too fine for the practical task of providing the young players with three tailor-made pieces for lively music-making, written well for the strings of the astonishingly accomplished ensemble.